There are many churches claiming to have fragments of the True Cross. It is believed that the cross was lost until Constantine’s mother Empress Helena traveled to the Holy Land in search of religious relics in 326-328. She traveled to the place where Jesus was said to have been crucified to discover that a temple had been built over it. Helena ordered that the temple be destroyed and the dirt beneath the temple removed. Beneath the temple three crosses were found, the crosses were believed to be those that crucified Jesus and two thieves, St. Dismas, and Gestas. In order to discover which cross was the True Cross, a lady of rank that had long been suffering from disease was called to touch the crosses. The instant the woman touched one of the crosses, her disease disappeared and she was healed. Thus, Helena believed that she had found the True Cross and the Holy nails. The Holy Nails were sent to Constantinople where they were added to Emperor Constantine’s helmet and the bridle of his horse. 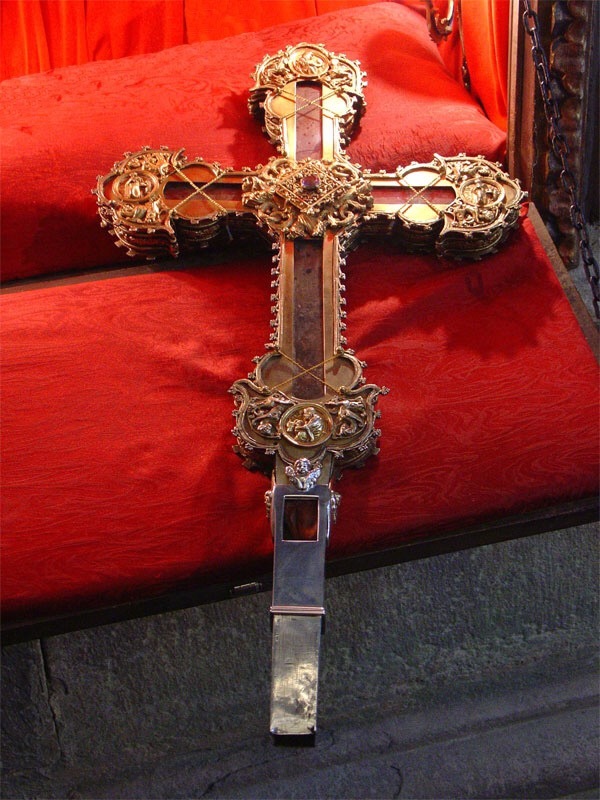 Part of the cross was also sent to Constantinople, while the rest was covered in silver and then given to the bishop of the city whom was asked to care for it carefully. The cross was cared for and taken out periodically for ceremonies until the fall of Jerusalem in 614. The cross Jesus died on is a powerful symbol for Christians, so it makes sense that the actual cross would be an object of great veneration. According to accounts by fourth-century church historian Socrates Scholasticus, the Roman emperor Constantine’s mother demanded that the church built on Christ’s supposed crucifixion site be demolished, uncovering three crosses below. True or not, hundreds of scraps of wood venerated as pieces of the True Cross spread across Europe. French theologian John Calvin of Protestant Reformation fame once dryly noted the sheer volume of these relics.